Fact and fiction combined to create a compelling historical romance. Family secrets can’t always be kept hidden. James Massey, Marquess of Avery, is hated by his mother and can’t understand why. Leonard Massey, Duke of Yarnton, has a secret that will protect his son but destroy his wife. Catherine Massey, Duchess of Yarnton, hates her husband and son and is determined they will be rejected by society. One family on an inevitable path of self-destruction. No one will come away unscathed. Audrey Harrison is one of my favourite Regency romance writers. She writes well researched and interesting stories that keep me turning the pages. They are romantic without any of the naughty bits and so can be safely recommended to all. The narrator, Melanie Fraser gives another excellent and faultless performance. 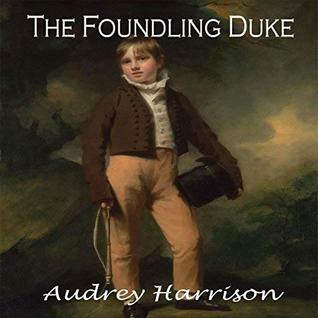 The Foundling Duke had an interesting plot line although there was a lot of scandal to overcome and I'm not too sure how realistic it would have been for the son of a maid to be accepted by all of society so easily. Nevertheless I was very sympathetic to the characters and their situations. I enjoyed listening to James and Olivia verbally sparring with each other when they first met and I delighted in the development of their romance as they realised they liked one another. I'm looking forward to reading the next book in the series, The Foundling Lady, and especially to seeing the twin siblings reunited.